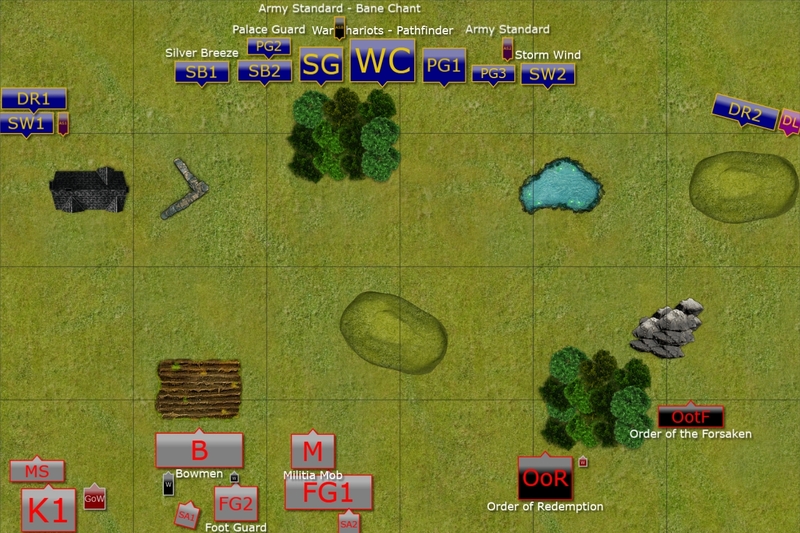 We also decided to try a new platform for our online games, Universalbattle 2 as a way to test it and provide feedback Lorenzo, the designer of this fantastic software. The platform is still under development, so you can also provide feedback from your games to make it even better! 40 Bowmen - main shooting unit of the army, bowmen come with the Nimble upgrade that is a very useful item indeed. Horde units may be a bit unwieldy so helping them to maneuver and not apply the penalty for movement is a very good idea. It also increases their effective range to 29 inches so they have a chance to outrange some opponents too. Their low armor is obviously something I would like to exploit. 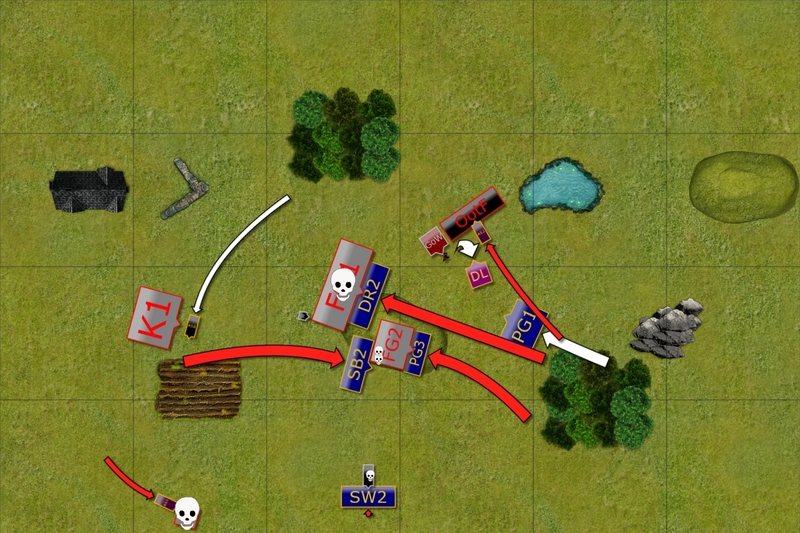 Last time focusing fire on them allowed me to rout the unit at the beginning of the game and my plan was to try and do the same. 40 Foot Guard - a very solid unit that can take a lot of damage and keep fighting. Defense 5+ on infantry unit is great too. However, against the army like Elves, they can deal good amount of damage too, especially considering the fact they hit on 3+. They would be a very hard nut to crack so I hoped to rather delay them and prevent them from joining the main fights. 20 Foot Guard - this regiment has a bit of a different role to play as it comes equipped with two-handed weapons. It means they have CS(1) which combined with hitting on 3+ makes them more aggressive unit and more likely to do some damage. But it comes at a price of losing some armor thus their defense is not as great. 20 Militia Mob - militia, on the other hand, is simply a cheap unit that is there to grab objectives or slow down the enemy. Not a glorious role to play but nevertheless very important for the overall plan. 10 Knights - first of the mounted regiments, the Knights are to crush the enemies with timely charges. Especially if that enemy is pinned down by the infantry and offers a flank attack. In addition, the Knights come come with Elite upgrade, that makes them even more dangerous. 5 Mounted Scouts - fast cavalry unit that adds to the ranged attacks of the army but mainly is there to assists the knights and allows the heavy cavalry to get into position efficiently, screening them from potentially faster enemies. I would need to try, if possible, to remove them quickly so that they don't interfere with my movement. 2 x Siege Artillery - long range and hard hitting elements. They may not be super accurate but they ignore cover and if they hit it hurts really bad. Ideally I would love to catch them unguarded as fast as possible but I simply had to assume they will do some damage regardless. Wizards - quite flexible and versatile in their roles. First, they provide a total of 11 Lightning Bolts that even the potential cover penalty is still enough to make me worried. In addition, these ranged attacks are very mobile too. Second, Bane Chant for either shooting or melee is always good to have. Against Elves it may be less crucial to get this spell through but it always helps. One of the wizards also carries Inspiring Talisman, further helping the army to maintain cohesive battle line. General on Winged Beast - one of the most mobile and fast hard hitting elements of the army. One of the two flying units and the one that will contribute greatly to the fight for the aerial control, that is quite important for both our armies. Either to be able to pick the flanks and rears or to prevent the enemy from doing so. 10 Order of Redemption - first of the allied units, adds to the army very nicely. It reinforces the theme of the Kingdoms of Men force comprised of various types of the regiments. It also forms an independent and hard hitting unit too. They are tough to destroy, especially when the damage is not done in a single turn. They inspire and have massive 20 attacks too. Fortunately, these are subject to Thunderous Charge (2) so if I can use any terrain to hinder their charge that would be great. 3 Order of the Forsaken - second of the flying unit, they will definitely try to fight drakon riders and do the same thing as they do. 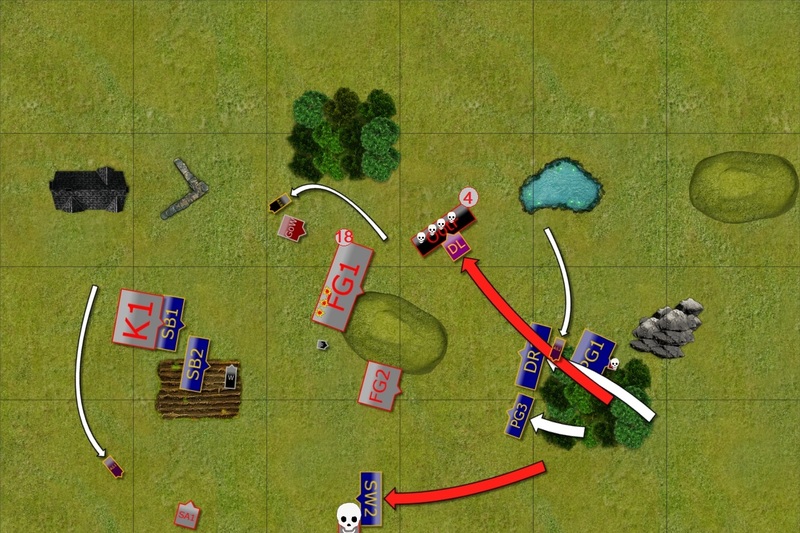 Fly around the flank and attack exposed sides of the slower units. It may be a good idea to tempt them to charge into terrain too, as unlike the drakon riders, they have Thunderous Charge (2) so hindered charges would affect their damage potential significantly. In general, faced the army with similar amount of elements, that has better ranged attacks and better staying power but is slower and less maneuverable than my force. As you can see there are three elements that are new. First, I brought 3rd mounted army standard equipped with Bane Chant. I came to the conclusion that he would be a better choice than the mage because I mainly use Bane Chant and a source of Inspire. Having him mounted also provides the chance to have that Bane Chant with the faster elements if required. Because of that I also got some points to spare on other upgrades. I decided to further reinforce the speed and maneuverability of the army. Pathfinder for the Chariots should help them be more of a use in melee as with their bigger footprint they often cannot avoid terrain. Not losing TC(2) can be quite useful. Making Drakon Lord faster than enemy fliers may also be a good thing to have and Speed 11 on its own can take him to the positions I want him to be faster. I apologize for lack of deployment order. I made a mistake and didn't check if I can copy chat under new software and at the time it was not possible. I didn't make notes and unfortunately, I cannot recall the exact deployment order of both armies. However, I know that a new feature to copy the chat has been added so I should be able to have relevant information for the next report! 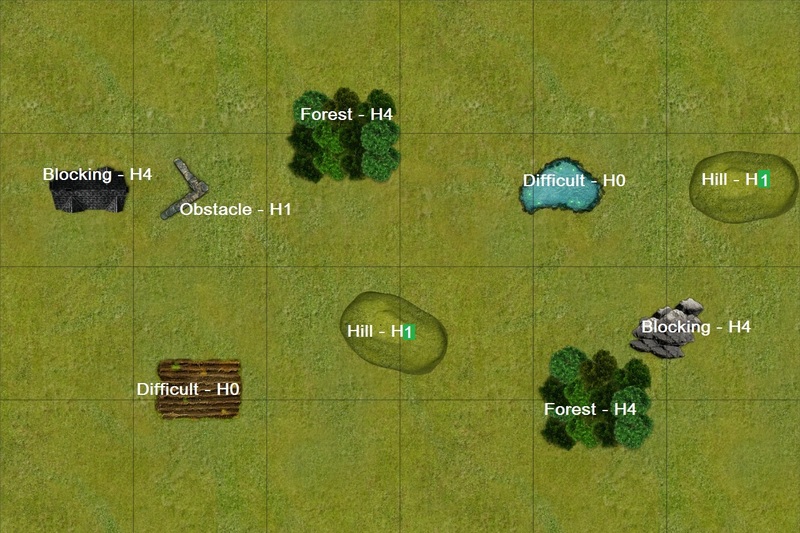 We played Dominate scenario and that meant that the horde formations would be very happy to occupy the middle of the battle field. I decided to form the majority of the army in the center too so that I would be able to harass and engage any enemy unit wanting to get there. At the same time I deployed fast elements on the flanks to try and outmaneuver my enemy and possibly get to the positions that would allow taking on the big units from multiple directions. But Mike countered that with his own cavalry and fliers so it was shaping up to be a very interesting game where both flanks and centers were contested. Mic got the first turn! As the cowardly Elves were hiding behind various obstacles, there were not that many targets available just yet. But that is why Siege Artillery was brought for. Unfortunately, the firs shots went wide and only a few Lightning Bolts reached Elven Knights on the left flank. Elves advanced a bit more aggressively although kept their distance on the flanks, trying to outmaneuver their foes. Then the shooting started and Elven arrows found their targets despite the Bowmen in a good defensive position. It seemed that good, old tactical advice of focusing fire on a single target worked very well! The army of Kingdoms of Men and their Brotherhood allies moved a bit more aggressive this time. The units on the left flank clearly tempted Elves to charge the Mounted Scouts and the combined efforts of the wizard and bowmen hurt Elven Knights too. 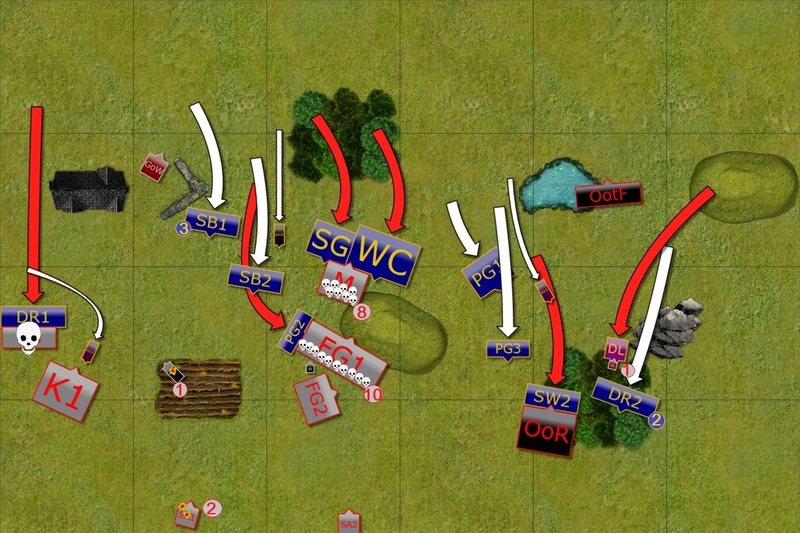 Siege Artillery found the mark and the impact wavered the Silver Breeze cavalry. Last but not least, the wizard supporting Brotherhood allies also placed a few Lighting Bolts against incoming Drakon Riders. Elven Knights on the left flank charged the Mounted Scouts but their previous casualties affected them significantly and the attack was not as successful as they hoped for. 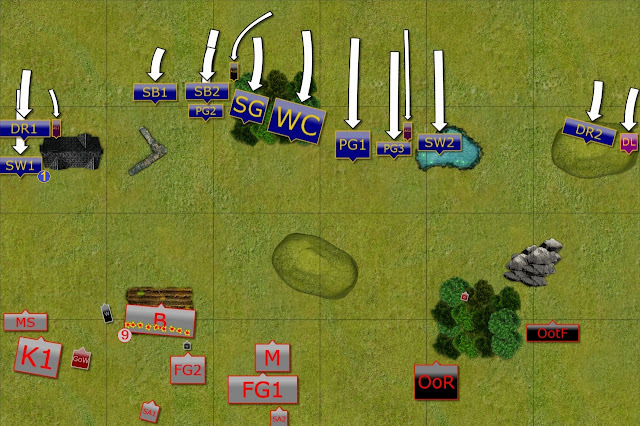 Mounted Scouts got wavered, however, and the enemy heavy cavalry was blocked for a while. 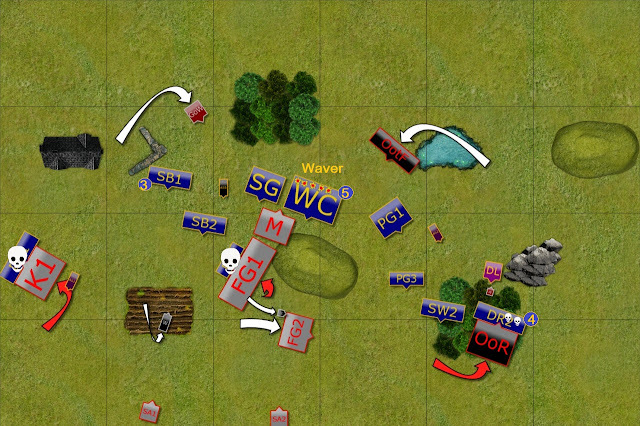 The shooters continued their duel with the Bowmen and this time three Elven units together managed to inflict enough damage to rout the entire unit! 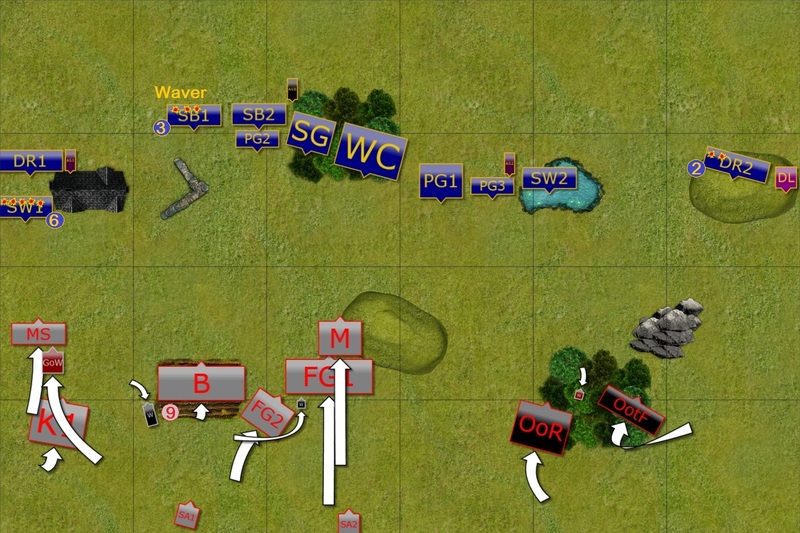 Meanwhile, the units on the right flank tried to set up the trap against the Brotherhood allies and tempted them with some potential charges. The fliers move forward through the gaps. Elves left a few openings, however, and the General and the Order of Forsaken used them to their advantage. Both flew to safe places and landed behind the enemy lines. In the meantime, the wizard finished of Elven Knights on the left and the infantry moved towards the center to contest the objective. Elves decided it is time to attack. Drakon Riders on the left routed the scouts and reformed assuming the army standard would distract the enemy knights for a while. In the center, Palace Guard had a chance to flank charge the Foot Guard horde and did so to inflict damage. At the same time, Sea Guard and War Chariots charged Militia Mob that surprisingly held its ground! Storm Wind cavalry on the right occupied the enemy Knights while nearby units positioned to take advantage of that. But is the unit of Order of Redemption truly pinned down? Elves pay for their mistakes! Elven units over committed and now was time to pay for the mistakes. The Knights on the left simply ignored Elven Army Standard and charged the arrogant Drakon Riders who were too surprised to hold their ground. 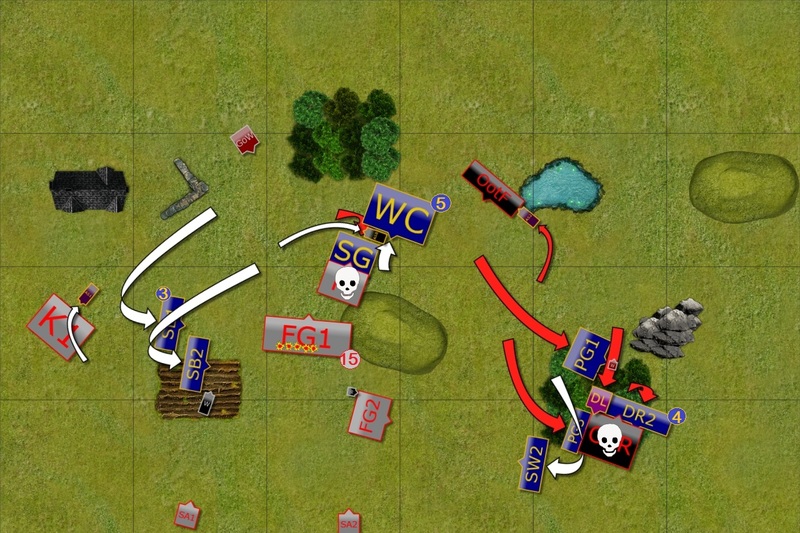 Using the opportunity that Militia still blocked the Elven units, Foot Guard punished the Palace Guard for their folly and reformed to faced the enemy again. While Siege Artillery bombarded Chariots and wavered them! Suddenly, the situation didn't look so good for the Elves. Order of Redemption copied the maneuver of their companions and charged second unit of the Drakon Riders but this time the difficult terrain was the ally of the Elves and they managed to survive the attack. Elves win on the right flank. The counter attack was tough but Elves had to keep pressing forward. There was no turning back now, especially with enemy fliers behind their lines. 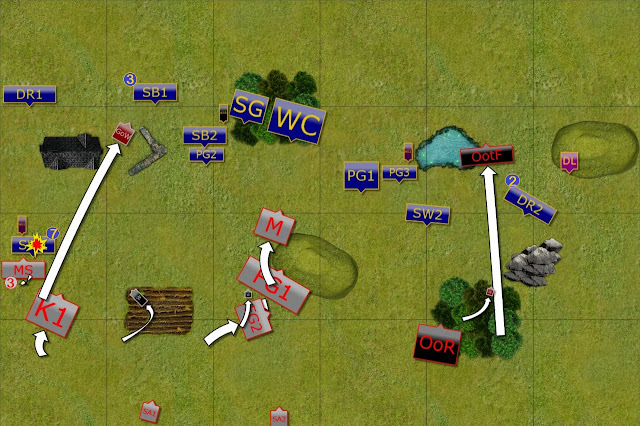 First, some of the units on the right flank charged Order of Redemption and managed to rout it! That definitely relieved some pressure! Unfortunately, Palace Guard regiment could not get rid of a single, stubborn wizard. At least he would not cast any Lighting Bolts. In the meantime, Silver Breeze cavalry shot at the damaged Foot Guard but they held their ground too. Kingdoms of Men army dominates the center. 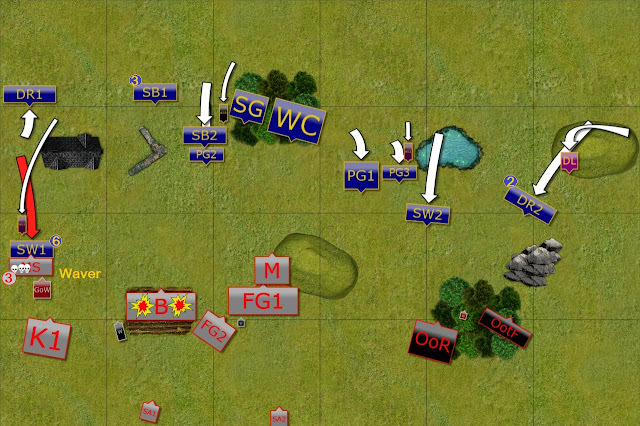 In the center, flying units and Foot Guard had no trouble in routing enemy units and for now they dominated the center of the battle field. Would Elves have resources and time to swing the balance back into their favor? Elves had to react quickly and they sent two fast units to try and outflank the enemy as well as to pin them in place while other units maneuvered for one more charge. Silver Breeze cavalry units targeted Foot Guard one more time but the stubborn warriors still refused to yield! Kingdoms of Men - last charges! The Knights attacked the Silver Breeze again and this time the Elves perished for good. The General and the Order of Forsaken both attacked the Drakon Lord. Despite minor amount of damage it was still enough to waver the Elven general. Lone, brave wizard charged the Elven cavalry and to a surprise of both, the knights and the wizard, he actually inflicted some damage! It was the last chance to swing the balance for the Elves and they went for the options that allowed to secure the draw. Instead of shooting at the Foot Guard and hoping to rout them this time, the Drakon Riders attacked the enemy and made sure they were gone. The combined charge of Palace Guard and Silver Breeze was not that efficient because both units were hindered. However, this attack was mainly to get both units into the center zone and to pin the enemy in place. With neither army gaining enough advantage and quite a few casualties on both sides, the generals agreed to withdraw. Thanks a lot, Mic, for the great game! It was fantastic to have a re-match and I am just sorry it took me so long to play one. I hope you enjoyed the game too! The fact that I made the same mistake 3 times in a row is really bad! I am talking about allowing Mic to perform corkscrew charges. First with the Drakons on the left, then on the right and finally, against the Silver Breeze cavalry. These examples show that positioning of the blocking elements have to be careful. Looking back at the game allows to check what were the other options and I think I found some that could have been a better choice. I admit I didn't think about them during the game but that is why writing the reports can be so helpful for the future games! One of the situations I have in mind took place in my 3rd turn. I attacked with Sea Guard and Chariots but did not rout Militia Mob. It was important because with this unit still blocking mine, I could not continue attack against the Foot Guard and was trapped to be charged later. What I didn't consider was a flank charge against Militia with my Silver Breeze. Alone, my fast cavalry is not great in melee. 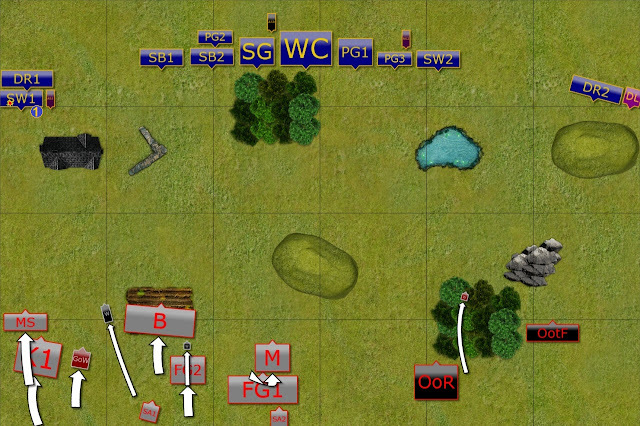 But here, 14 attacks from the flank, even hitting on 5+ would have allowed for a better chance to rout the unit. Moving Palace Guard unit forward in the same turn was also a better option because I could have threatened attacking the Foot Guard from the other side. 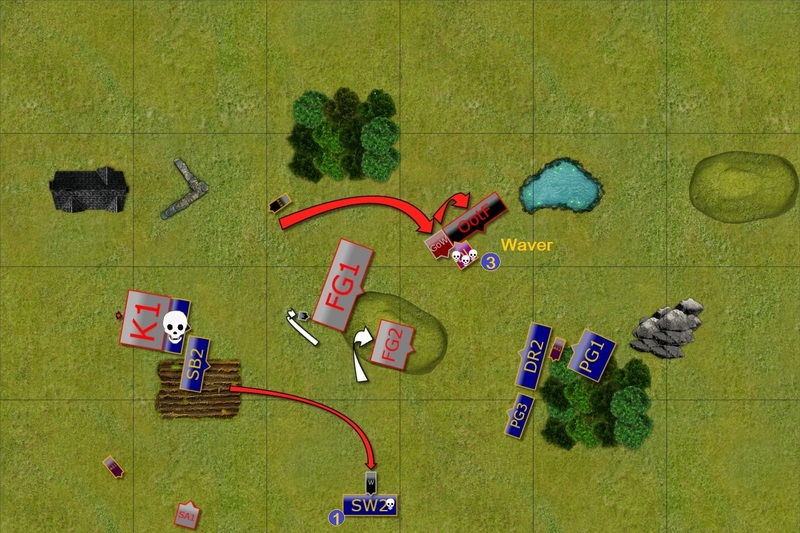 I moved my unit too much towards the flank and then I spent too long chasing a wizard. 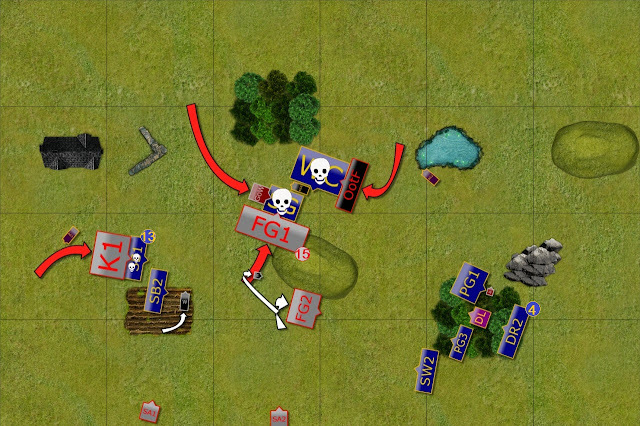 As a consequence, that unit was too late to get back to the center when I needed it to claim the scenario objective. Another option that turn that should have been considered was a joined attack on the flank against Foot Guard with another Silver Breeze cavalry and Palace Guard troop. They would have no chance to rout the unit but in doing so they would have prevented a reform after counter charge. These three different decisions would have allowed me to keep the momentum of the attack despite the fliers moving around my flanks. As my army lost the momentum, these fliers had enough time to position for flank charges and threaten other units. I really enjoyed your analysis at the end of the report. I was surprised that your BSBs did not block his knights, but I suppose it was a situation where his frontage allowed for a wheel without stopping in your unit. Normally you can't be within an inch of an enemy but since he charged he could bypass that rule. I'm glad that came up because it gives me something that I need to consider. Are you still liking the chariots? 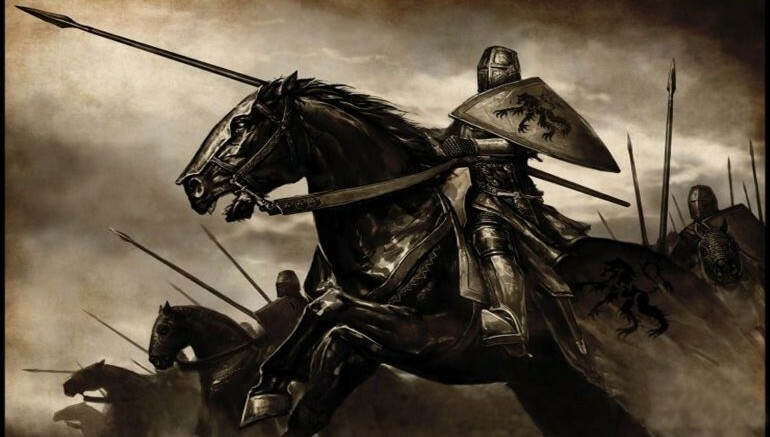 It would be hard for me to take the chariots over a troop of knights (lower charge range, lower melee and attack value, lower defense and larger footprint). They do offer 8 shots at 4+ and a slightly higher nerve and unit strength, so there are definitely some benefits. I like your new list and am curious to see how it performs in the future! It is quite funny that I made such mistakes with my Standards. But it showed that blocking the enemy is not always done by simply putting your unit in front of the foe. The crucial rule here (and thanks Mic for reminding me about it, somehow I forgot about it!) is that you can still pivot over the the enemy models as long as you finish your pivot in a clear spot. In this case the Knights pivoted over the Army Standard or Storm Wind and ended it in a clear position. However, I think that if only I positioned Army Standard a bit to the left and presented the flank (to widen the frontage), it would have worked. Of course, the Knights would be able to charge and then advance but that is determined by d6 roll after the melee. I actually like my chariots! I really enjoy using flexible units. They suffer from the fact that whatever you do with them may not look spectacular on its own. They are designed to work in teams, not alone. So no glorious charges that kill the enemy in one go, no deadly valleys that do the same. But they add to the flexibility of the army. With their Sp8 they and Large Cavalry they can move to good shooting position and see more than other units. So that in the late turns they should be able to shoot at damaged enemies and force nerve checks. They can start out of range and move in to shoot in my turn. They can threaten to charge something that gets too close and simply block it. Either because the enemy will not fly or will not see other units (Large Cavalry and bigger foot print). They can assist both infantry and cavalry, whoever needs it more at a time. The changes I made are not huge but I think they better reflect the style of play. I am also curious what I can do with the army as I expect some changes in the armies of my opponents too! I've recently caught up on all your battle reports and they are as stellar as usual. Great stuff! Thanks! I am glad you like them! Hopefully some new games would be arranged in the near future. Cheers!